Carrot Seed Essential Oil (Daucus Carota) - Sweetgrass&Rain Inc. Carrot is a domesticated form of the wild carrot, Daucus Carota an annual or biennial plant with hairy leaves and umbels of white lacy flowers with purple centers. Carrot Seed Essential Oil, high in carotenes, is considered one of the best oils to enhance the appearance of mature skin. The name is derived from the Greek Carotos and had great medicinal value to the Greeks and Romans in ancient times. 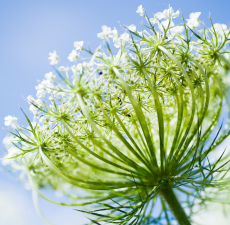 The herb was transported to the Americas where it became known as Queen Anne's Lace, and the edible orange root as we know it was developed by the Dutch in the 1700's.